When I saw Noah, I was confused about why the Red Tribe in American (social conservatives) hated it so much, and the Blue Tribe (liberals) seemed to like it. This is an attempt to be less confused. Putting aside the religious angle for now (which may be the dumbest idea ever), it originally seemed to me that this movie espouses strong Red Tribe ideals. 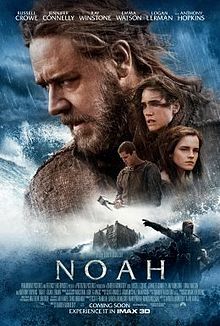 The thing that most strikes me about the conditions portrayed in this movie is that Noah’s family is rich because they are Good Land Owners. They have their own section of the word, away from the Looters and Takers, and they take very good care of it. They reap the rewards of their superior management accumen in the form of a comfortable life in beautiful surroundings. They are basically the stone age equivalent of an ideal corporate CEO. Or Wise Patriarch. Of course I didn’t much like Noah’s family in this portrayal, as they’re kinda elitist bastards. But I could understand them and their position, and the other side was even worse, so it was an enjoyable movie of greys and flawed people trying to survive. So, proposition #1 – The viewer gets a feeling that Noah and his family are awful 1-percenters, and since the religious folk don’t like that feeling about their mythological heroes, they hate the movie. Another way of looking at this is by focusing on the cause behind the conflict. The desperate hordes have fallen into the classic Malthusian trap. Their population outstripped the land’s capacity to support them, until there was only bare mud left, and they were forced to invade Noah’s land or die. This matches the angry rhetoric calling Noah an “extreme environmentalist” or something, because I guess nowadays conservation is no longer a conservative position, which is weird. Noah’s family, OTOH, followed the practice liberals are fond of to avoid the Malthusian Trap – Breed Less! They restricted their reproduction, to a point that I would consider downright dangerous honestly. As far as we can tell, there is no extended family here. Noah’s father doesn’t have any siblings, and Noah is an only child. Noah’s wife doesn’t have any relatives anywhere either. There’s no aunts, cousins, nephews, or even close friends. In terms of family (“biological wealth” as it’s been called), this family is impoverished. But hey, they have a great quality of life–not having to murder and cannibalize their neighbors while living in a grey hellscape. So there’s that. So proposition #2 – The movie portrays large-family practices as leading to Malthusian tragedies, which is a direct attack on Red Tribe values. I feel #2 is stronger, not only because it explains the “enviromentalist” claims, but also because it explains why Blue Tribe people like the movie. In Prop #1 Noah & Co are pretty unlikable, and I wouldn’t expect Blue Tribe to enjoy it as much as they did, because if they identify with Noah they should feel slimy and elitist. Under Prop #2 he’s more relate-able. I briefly entertained Prop #3 – that the movie was disliked because ultimately the answer to “What do you do with this problem” is “Kill everyone who doesn’t share your viewpoint.” Instead of searching for some better sort of solution, technological or otherwise. Portraying one’s God and/or heroes as genocidal monsters is bound to make anyone grump. I don’t think this proposition has a leg to stand on, partly cuz no one said anything about that aspect, and partly because the entire Old Testament is full of genocides. It’s kinda God’s thing back then. It’s the most scripturally-accurate portion of the movie. To say anything negative about that part would be to admit that God is a genocidal maniac, and I don’t see that happening. So prop 3 is discarded. If anyone hasn’t seen the 2014 Noah movie, I enjoyed it quite a bit, and I recommend it. Not as good as Last Temptation of Christ, but certainly an interesting take! I mostly agree with various aspects of your props, but I’m pretty sure it IS mostly the religious aspect of the story. It included parts of the Bible that Reds don’t like to think about (like warrior rock angels / Nephilim or Watchers or whatever they are called) and it included stuff that wasn’t in the Bible (like Tubal-cain making it onto the Ark and Noah trying to make his daughter have an abortion). Oh, and all the nods to evolution being real. I’m certainly more blue than red and didn’t care much for the movie, Emma Watson’s performance excepted. I think at least some of it, also, is that it takes a more Jewish approach to scripture. God is in some ways a very alien and terrible thing in the Noah movie, and most of the emotional beats in act 3 come from wrestling with that. In particular, Noah’s recognition that the darker aspects of mankind survived the flood, calling in to question the *point* of all that slaughter. In Christianity, and in particular the Protestant and Mormon wings of Red Tribe Christianity, God is human and humanized. There’s still a problem of evil, of course, but there’s a reassurance that this can all make sense at the individual’s level. Think of C.S. Lewis’ Great Divorce, where those in Heaven finally “get it” and try to convince outsiders from Hell that all this is all maximally good and maximally just- there’s a perspective, achievable by humans, where the doubt just evaporates. Noah has a more pensive darkness, offering no such reassurances; there’s capital-G Goodness in Noah’s world, but not much comfort as such. I might expect that people who are very concerned with the biblical accuracy of the film — folks who object to the various liberties it takes with regard to the source material, how it frames the conflict and the characters, and how it differs in tone and message from the various sermons on the subject that they have heard in the past and take quite seriously — would enjoy the film less than people unconcerned with those aspects, who are free just to treat it as another big-budget summer blockbuster piece of entertainment. I watched the movie and thought it was so beyond terrible that I never imagined anyone could enjoy it. You haven’t actually stated why you enjoyed it. So why did you like it ? I’m somewhat enamored of Gods that are Alien and Unknowable. Fair enough. Maybe if someone wrote a rationalist fanfic of a bible story I could get into it ……. I think you are way over analyzing this. Red tribe hates this movie because that isn’t what they thought angels would look like.